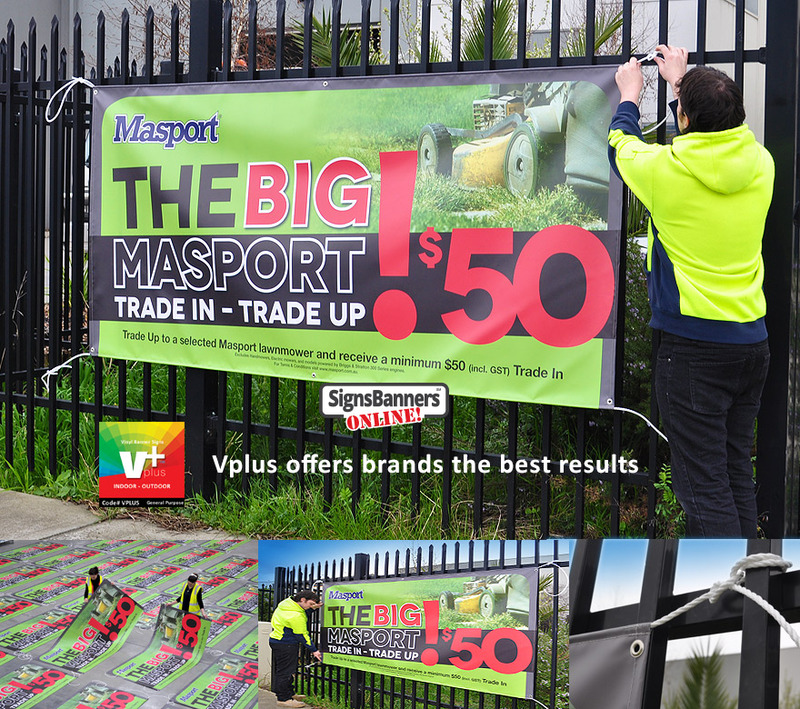 Vplus is super strong 16oz scrim PVC vinyl banner with inner no-tear layering used for outdoor branding in all sizes by using wide format roll to roll signage printing via DTG hi-speed machines. 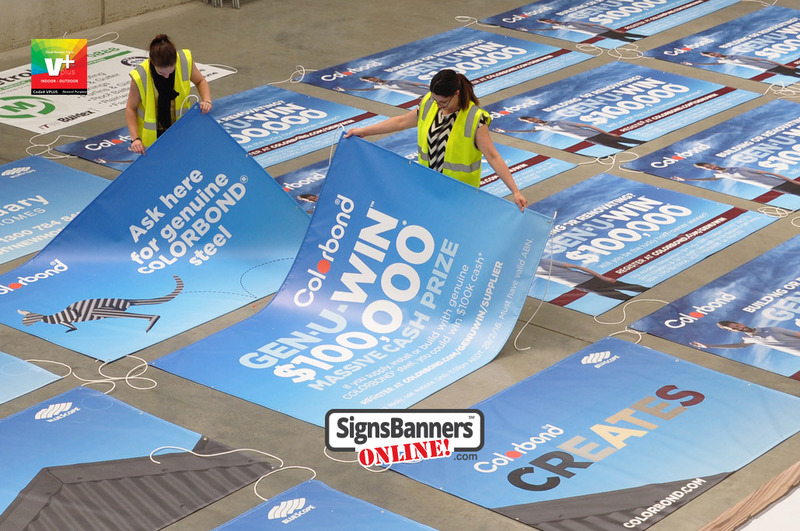 ''They are now the leading supplier of quality Vinyl Banners for American brands everywhere''. Shop, factory, field day, hanging, wall and fitted banner signs. All Industries signage. Short term promotional signage banners, low cost makes bulk ordering easy. 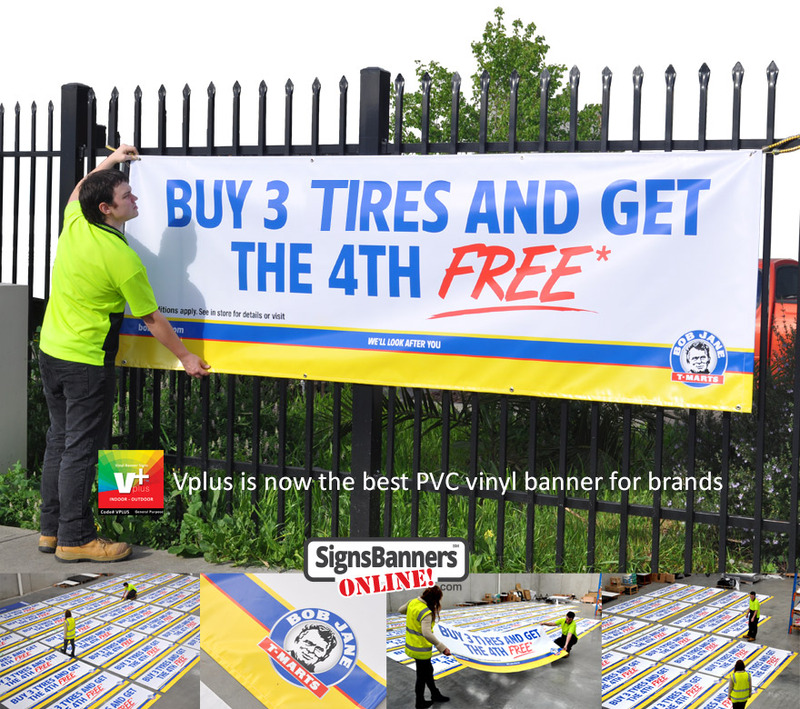 Vplus Vinyl Banner (VPLUS) is a smooth scrim pvc vinyl with inherent internal weaved structure as a minimum lay. PVC is popular with general signage companies due to it's relative ease of production and relative looks however many differing qualities will make the product a success including finishing such as hemming. "Thank you very much my vinyl banners are amazing. I am happy to refer vplus to all." "Vplus is a better vinyl banner, the inner structure makes it so much stronger". #1 Billboard sizes are joined from master rolls. 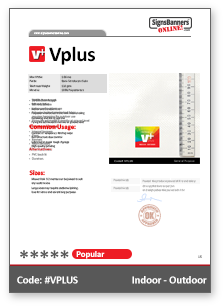 Comparison VPLUS is a scrim pvc vinyl material with ink on top without penetrating the fibres. It may scratch, crease or mark. Comparison: Vplus is excellent color accuracy. Printed in CMYK digital process. Custom size to suit customer orders. Easy to attach with many fitting options including silver no-rust eyelets, ropes, hook n loop and pole pocket sleeves for securing banners to a pole. Large sizes may be folded for shipping. Note: Also consider Heavy Duty or TEPRO600 Te-Pro Canvas. #1 Size is unlimited, the size range is medium to large. Events may order one (1) piece or fifty (50) pieces all custom sized to suit their applications. Ideal for branding and bulk printing. Quantity discounts are available. 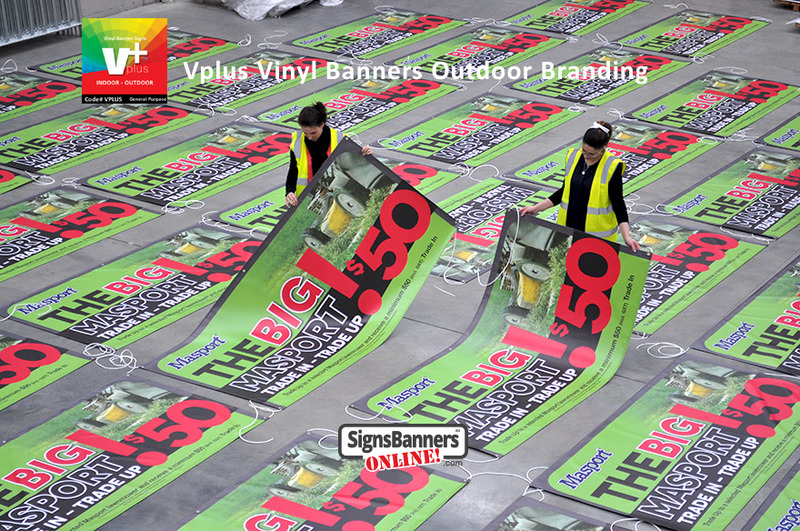 Supplied to over 150 brands, agencies, designers and sign firms. Factory sewing and fitting. Special requests available. 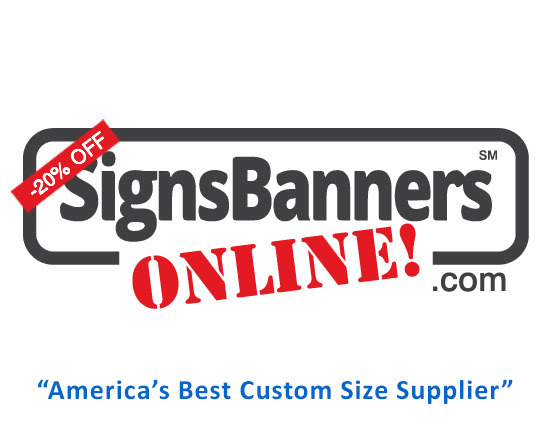 The vinyl banners offered by signs banners online are excellent value, quality and color so if you're a brand manager, its the one to use for satisfaction. Use for general purpose signage advertising materials - semi-flexible. eg: Banners, signs, displays. Vinyl banners can be manufactured with pole sleeves, eyelet grommets and specialized features custom to your needs. Discounts available. 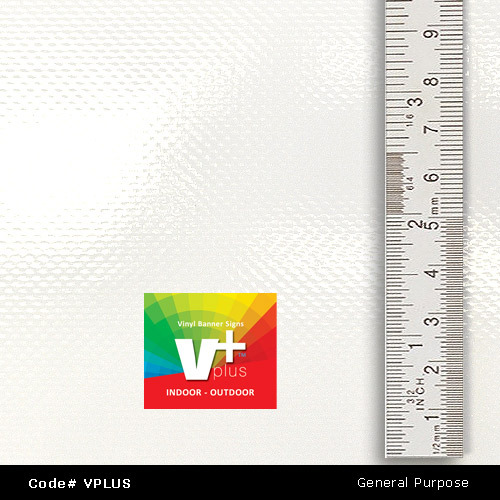 Vplus offers superb color output, long life, general purpose and durability. NOTE: We use and recommend Vplus for our own signage. Vplus is #1 customer favorite.